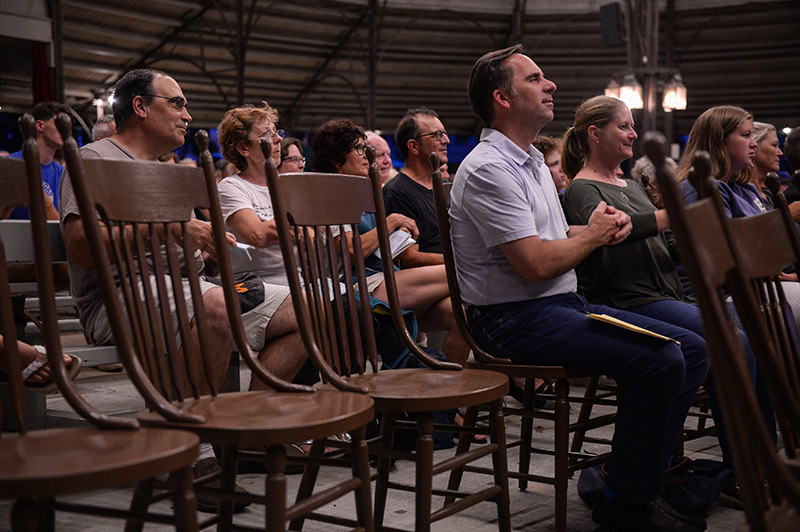 The Tabernacle’s Community Sing celebrates at least 100 years. 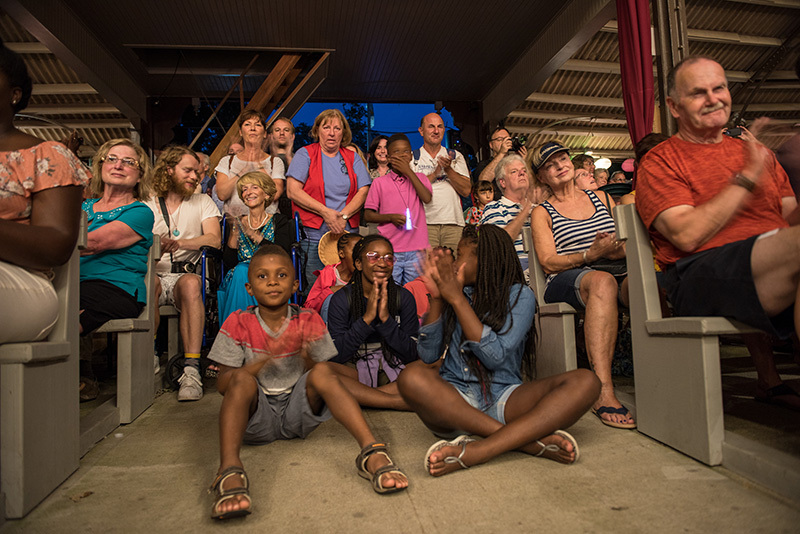 For all its glitter and excitement, the Illumination Night sing-along is but one of the Tabernacle’s beloved Community Sings, which attract Campground residents, other Islanders, and visitors all summer long. 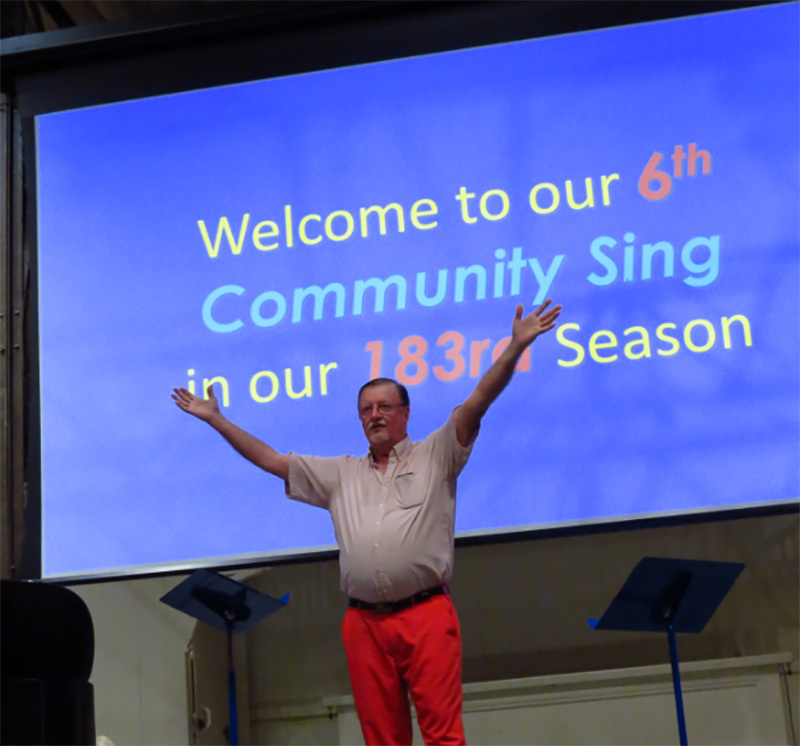 This year officially marks 100 years of Community Sings, although many say the upbeat events began around 1904 but were not documented until 1918. 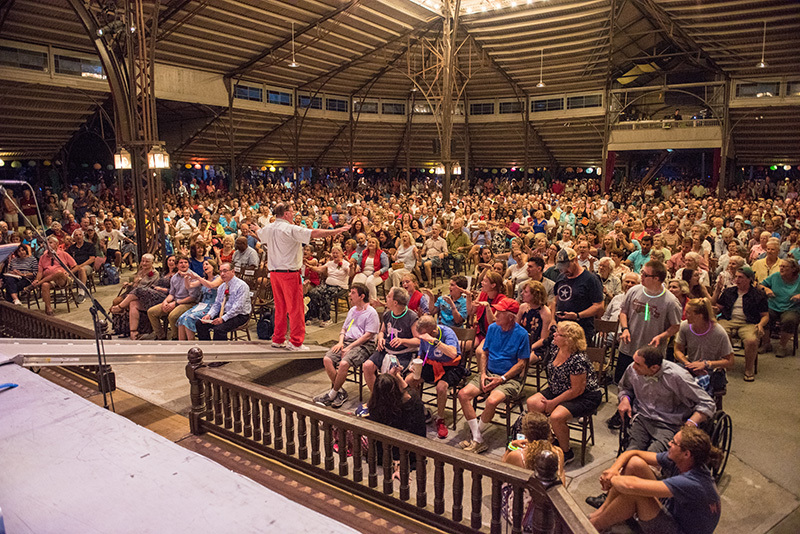 Music has been an important part of Campground life since camp meetings began in 1835. Later, people wanted to sing other music besides hymns. 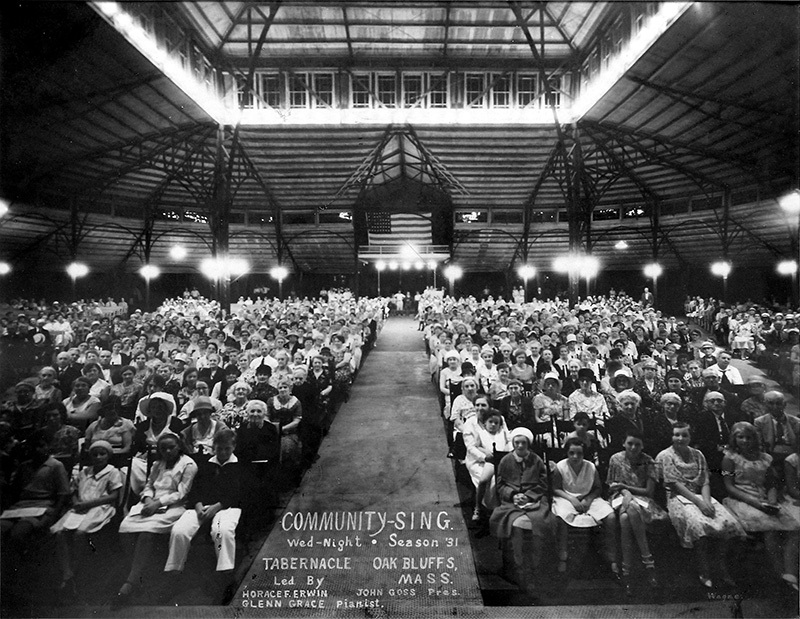 Community Sings began, popular entertainment in the days before radio and television. The Campground is a peaceful oasis of traditional summertime leisure in the midst of busy Island life. Neighbors greet passersby from porch rockers, tend flower gardens, walk dogs. 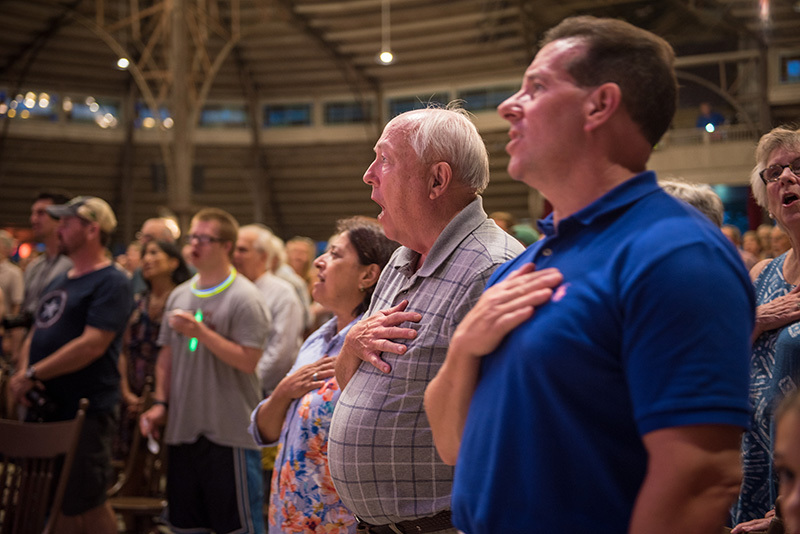 On Wednesdays as dusk falls, music wafts from the Tabernacle as voices join in the Community Sing. 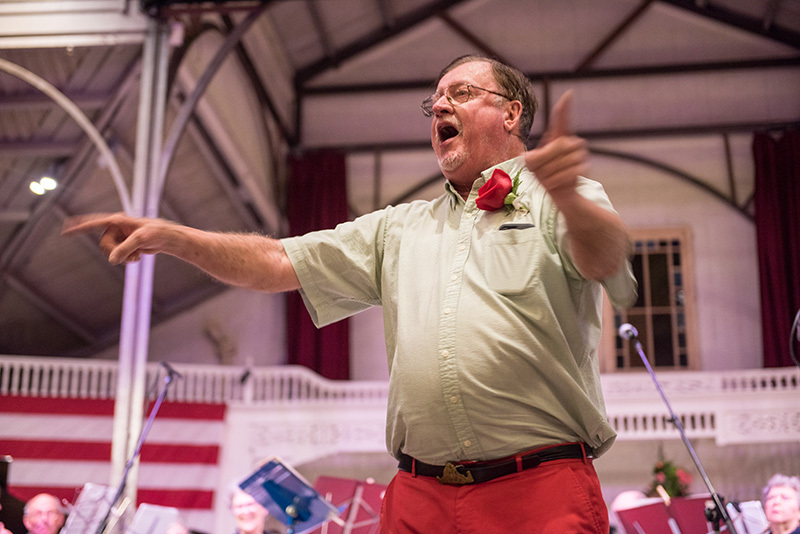 Music director Bob Cleasby takes the stage as he has since 1991, conducting songs and encouraging even the most reluctant visitor to sing along. The crowd includes toddlers and school kids, older visitors and grandparents, young families, teenagers, couples on a date. 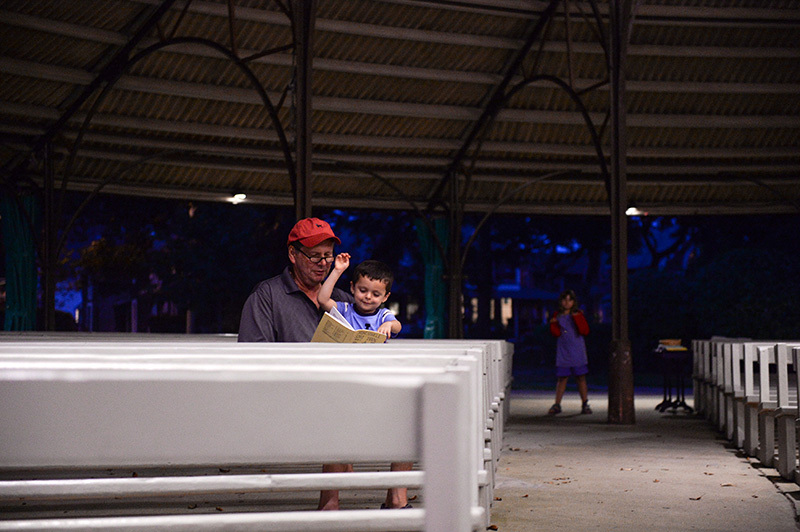 Campground regulars mix harmoniously with Chilmarkers and Edgartonians, wash-ashore newcomers, first-time visitors. Everyone gets a warm welcome and a copy of the “Tabernacle Song Book” to use. The little blue or yellow booklet, published in 1985, is filled with old favorites. There are campfire tunes, familiar hymns and gospel songs, rounds, and silly ditties. The tunes have one important thing in common: They are wonderfully singable! Amaryllis Iglesias Glass and Stefan Hayden Young, top-notch professionally trained pianists, share accompanist duties for weekly songfests. 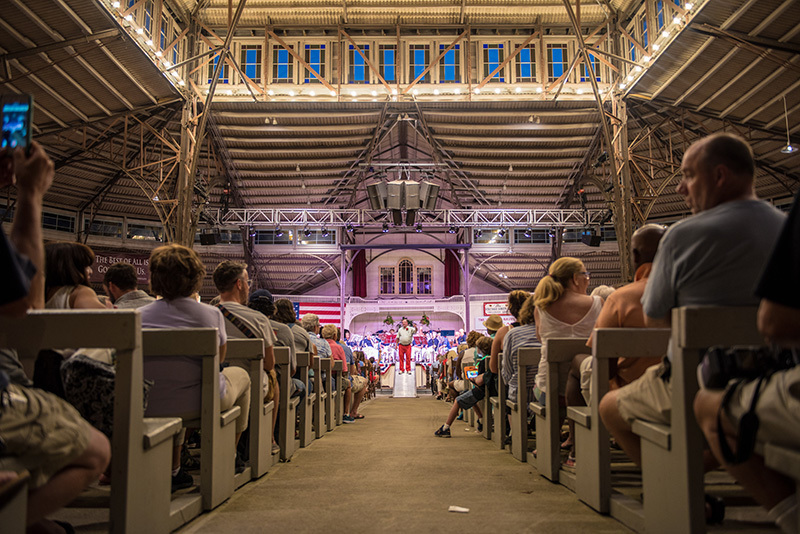 On Illumination Night they thrill audiences with brilliant duets. Island keyboardist and composer Phil Dietterich fills in occasionally. “I call him my third staff member,” says Cleasby. This spirited scene, repeated every Wednesday in July and August, resonates with echoes of days long ago. 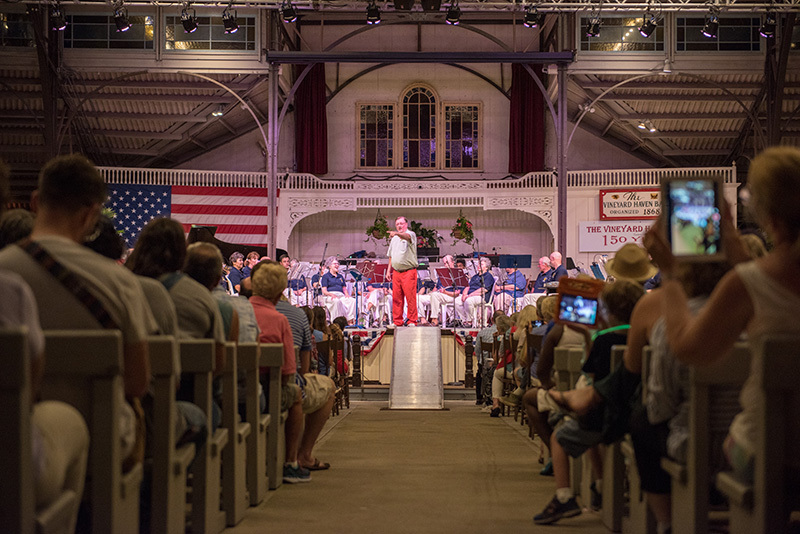 Miriam Huss Williamson, a longtime Campground resident, reminisced that “the singing 1920s were happy years” at the Tabernacle. 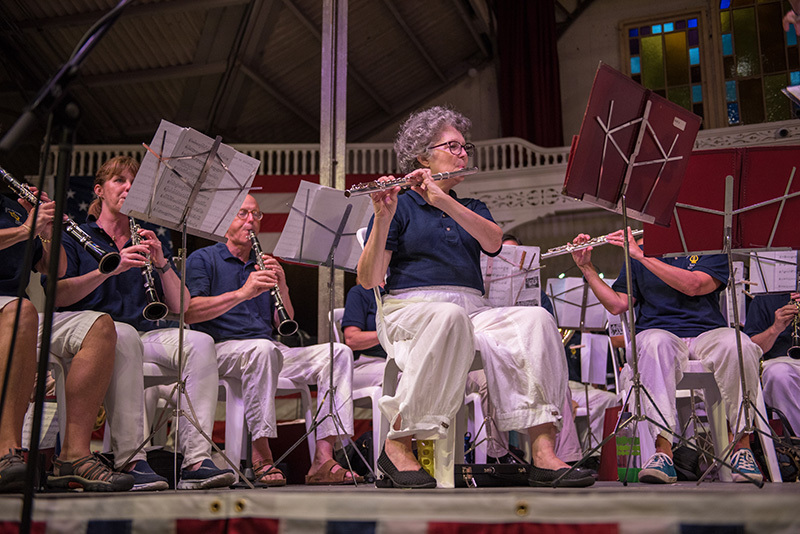 “Singing could be heard almost anywhere, almost any time in Oak Bluffs, because half the members of the choir of the Tabernacle lived together, played together, and loved to sing together wherever they were,” Williamson said. Beginning with Dr. Adams, other talented musicians led the weekly sings. Professor Erwin, known for his slide trombone, began in 1929. Dr. James R. Houghton of Boston University’s music department took over in 1932. Then came the Rev. John Rosengrant, George Arkwell, Philip “Phil” Buddington (“the man in the red coat”), Gordon Almstead, and John Azevedo. 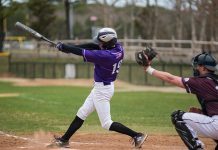 Cleasby, a native of Cranston, R.I., called “Mr. 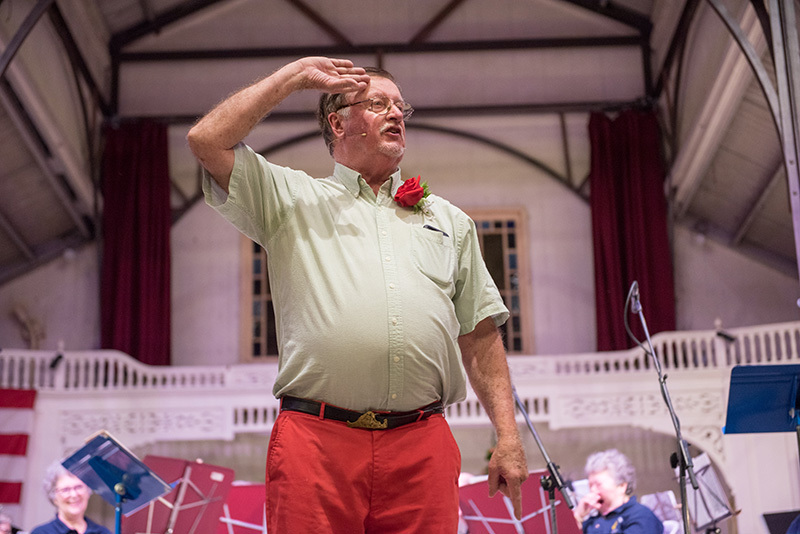 Red Pants” for his bright attire, brings decades of experience as music educator, choral conductor, performer, and community arts organizer. 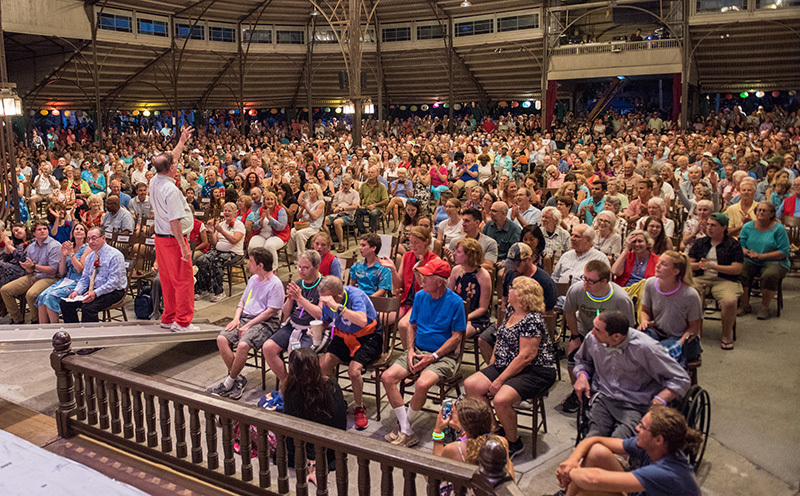 But it is his energy, enthusiasm, good humor, and love of music that delight this crowd. He also brings a wealth of memories, having grown up summers in Campground cottages owned by his grandmother and father. 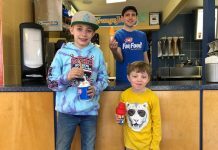 He and his wife Marietta came with their three children, and remain Campground regulars. He joined in Community Sings and knew former directors before being encouraged to apply for the job. He was chosen after successfully leading a Community Sing as a test. Singers often tell him with tears in their eyes that a certain number was a favorite of their grandmother, grandfather, or other loved one. “Every song has a story for someone sitting out there; that’s really nice,” Cleasby said. Community Sing traditions include a chorus of “Happy Birthday” after Cleasby searches out celebrants. 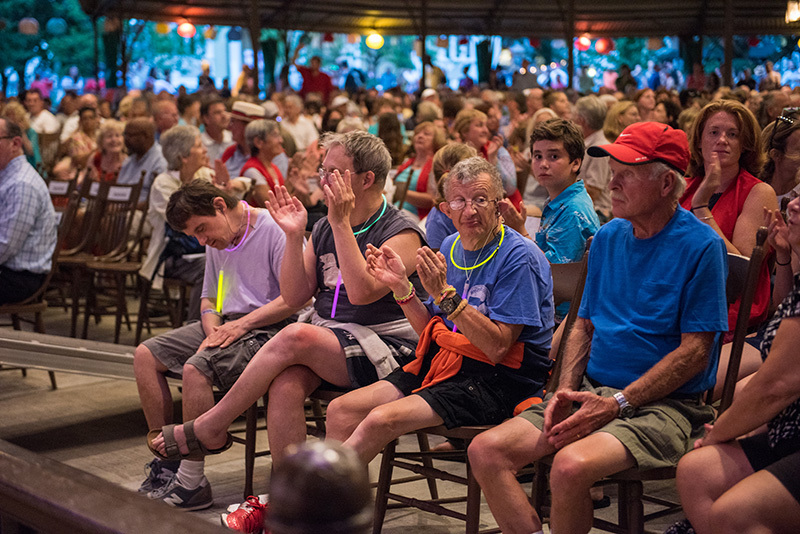 Hands are raised when he asks for first-timers, and how long audience members have been attending Community Sings — 50 years? 60? One regular has sung for 80 years, and raises her hand to thunderous applause and cheers. He asks singers where they live, from the Campground to other Vineyard or off-Island communities. 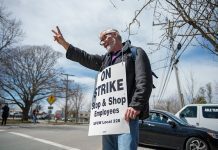 “There are many more from outside the Campground now, which is great,” Cleasby says. He is also pleased with large numbers of first-time singers. “Sing Your Way Home” is always the final selection. Cleasby encourages attendees to keep singing it as they depart, and some proudly report that they do. One enthusiastic educator teaches the song to her third graders every year. Cleasby notices that while toddlers and youngsters love to attend, teenagers stay away. But happily, they soon return as young adults, often bringing friends. 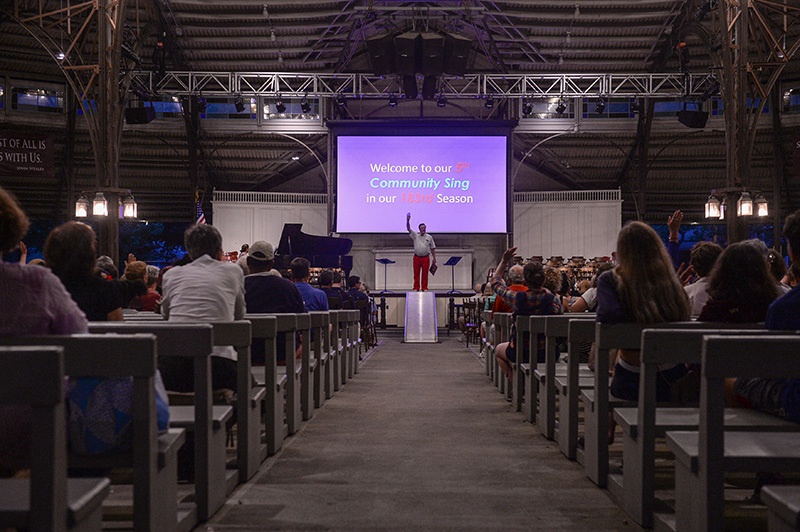 Community Sings have changed over time, according to Cleasby. 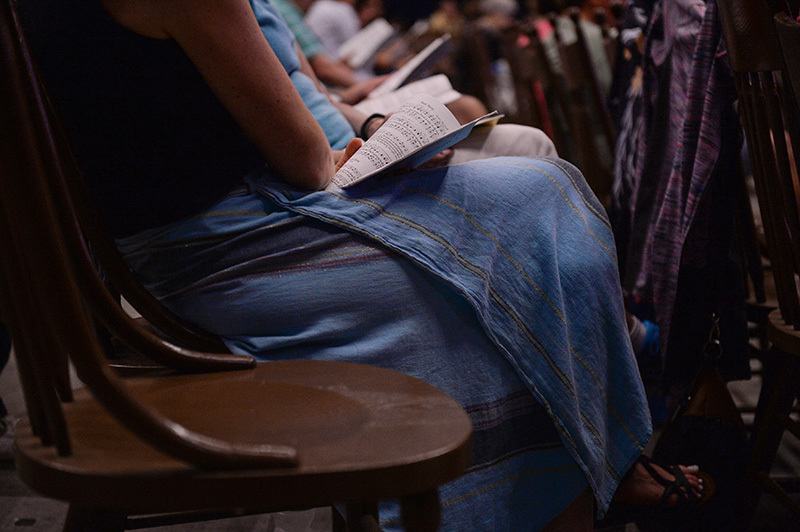 In days gone by, attendees came in their Sunday best; now garb is casual. Numbers of have grown from about 50 participants when he began in 1991 to an average 275 singers now. The Community Sings modernized when PowerPoint was introduced recently. This enables Cleasby to include songs not in the book, like Broadway and movie tunes and Beatles favorites, with lyrics projected on a screen. Cleasby deeply enjoys conducting the weekly sings, but admits the job has its demands. “The challenge for me is to get everybody going every week,” he says. “You have to have tons of energy. 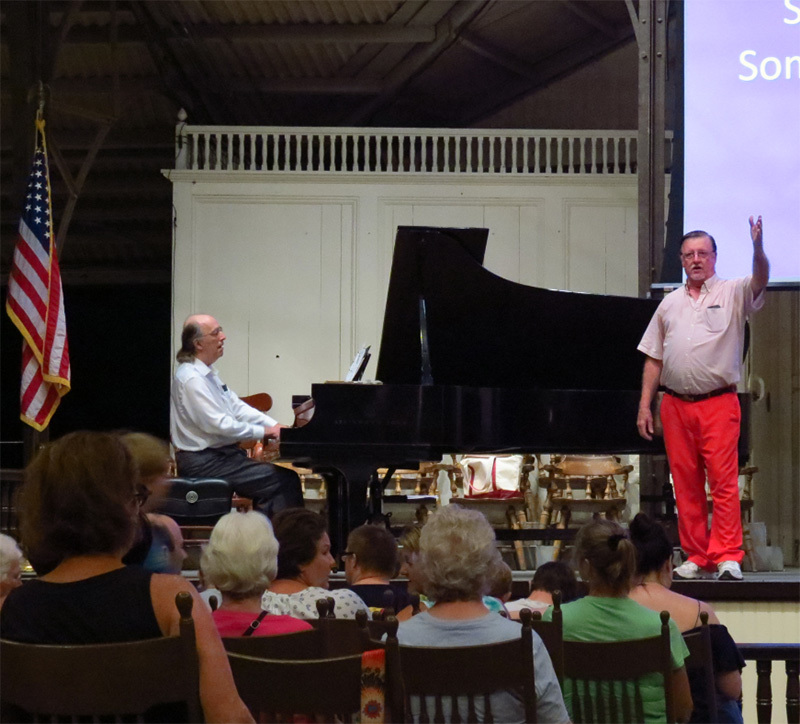 Lift your voice at the summer’s final Community Sing, Wednesday, August 29, 8 pm, at the Tabernacle in Oak Bluffs.